Asking the question 'What is Prestel?' is a bit like asking the question 'What is television?'. You can give the technical answer along the lines that a television is a device which allows you to see pictures produced from anywhere in the world and that it splits a picture up into lots of tiny dots which are sent through the air to be joined up again in your front room. However this fails to answer the real question "What is the use of television?'. In a similar sense Prestel is what you make of it. If there is nothing worth watching you can quite happily live without it, however once you start to use it you can get hooked. Before we delve into the contents of Prestel lets have a brief look at the history and workings of the system. In the early '70s, when British Telecom pic was still the GPO, the bods at the Post Office were looking at ways to increase the usage of the telephone system. Most homes with a telephone also had a television, and if you could pursuade the viewers to link the two you had a potentially massive market. This was at a time when home computers cost three months wages and were very rare and so a full keyboard was not envisaged, all that was needed was a keypad with the numbers 0 to 9 and the symbols * and #. The standard that was agreed upon was similar to that being played with by the BBC and IBA for teletext (Ceefax and Oracle), but there the similarity ends - as a service they are very different. The viewer could select a page of information by pressing * page-number #, or by just pressing a number from a menu page and being taken to the next one on that route. This meant that very little information had to be sent from the home to Prestel for every whole page which was sent the other way. Since the amount of information which can be reliably carried on a phone line is limited (especially if you want to keep the cost down) the rates of transfer were designed with this in mind. 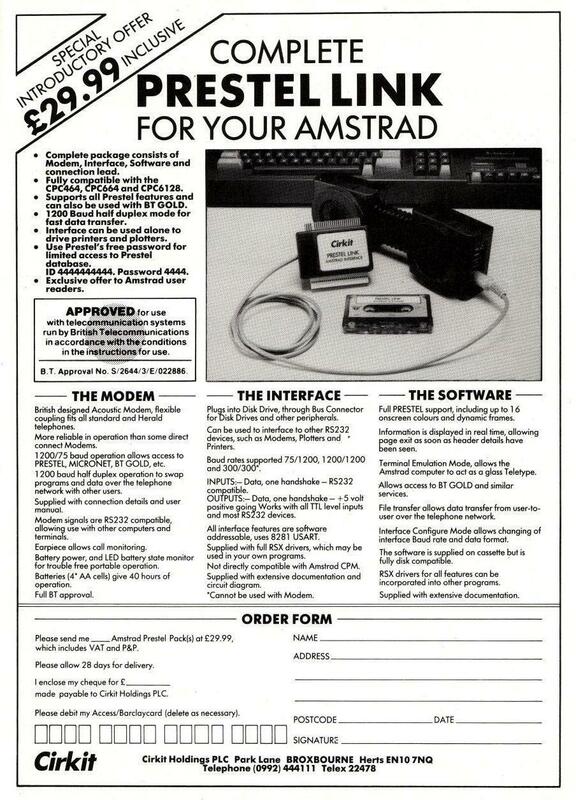 Information is sent from Prestel at 1200 baud (bits per second), which is a little faster than Amstrad speed write 1. The minimal selection information crept back down the wires at 75 Baud. The system worked and still works that way with a few minor improvements in terms of the features which are allowed. Since the object of the exercise was to make money for the Post Office, it was decided that both the people providing the information (called Information Providers or IPs) and the viewers should pay. The IPs rent memory on the Prestel computers and have the option to charge anyone looking at a specific page. The charge is split between Prestel and the IP. Users have to be registered. For this they pay £6.50 a quarter plus extra fees to join clubs which allow them to look at special pages. These clubs are called 'Closed User Groups'or 'CUGs'. This all results in quite a complex billing system, and it has been said that billing software cost so much that it would have been more profitable for the GPO to offer the pages for free and just make a profit on the 'phone calls! There is a time charge for using the system during working hours and before 1pm on a Saturday, however this does not really affect hobbyist users. Prestel is a Viewdata system and conforms to a European/Common Market standard. The standard allows you to have eight colours on a screen, forty characters across and twenty five deep, with only IK of screen memory. It does this by using special characters to mean change to a given colour,; from then on everything on that line of text is printed in that one colour. There are special codes to change the background colour and to provide flashing and double height characters. It is possible for the IP to build up a page with special conceal and reveal codes so that the user has to press another button to produce an item of information -such as the punchline for a joke. All these features require some smart software at the receiving end. There are some special chips to do the work, but these are unecessarily expensive and most home computers produce the graphics by using clever software. One of the latest features of Prestel is the dynamic page. Usually a page only shows a static image, either text or a diagram made up out of shapes to produce an image with a resolution of 80 by 75, although you can only change the colours in steps of 40 across and 25 down. By using a dynamic frame it is possible to animate the graphics. This works by sending commands to the user's system to move the cursor and then print another bit. To conform properly to the international Viewdata standard, the software needs to be able to handle all these features. 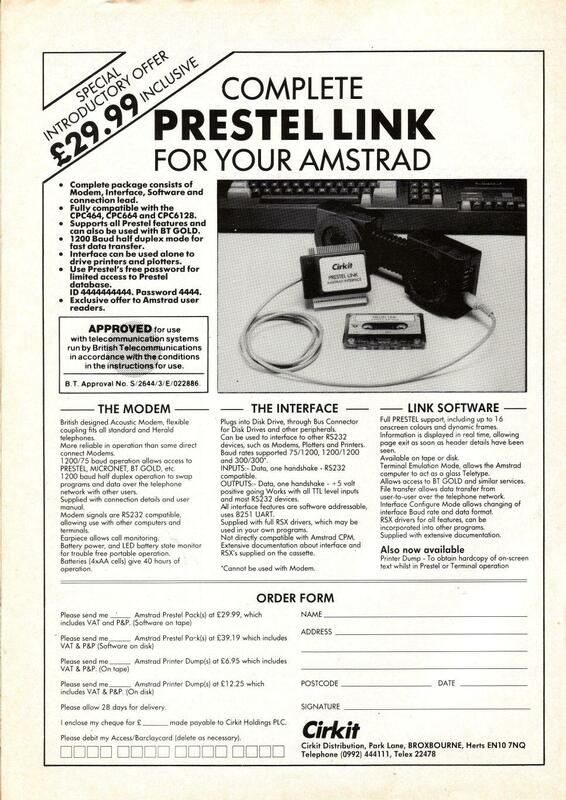 With the advent of home computers logging into Prestel, there is a further direction for expansion. Because a program is just a bunch of data and since all Prestel is really doing is handling data, it is possible for the system to send programs to you. This is done using a protocol called telesoftware downloading. A standard needs to be established for each computer - and as this has not yet been done for the CPC464 there is no Amstrad software on offer. Despite all the ways in which British Telecom earns money from Prestel, it has never made a large enough profit to cover the setting up and running costs......... because not enough people use it. The advent of the home computer and in particular the CUG for home computer users has started to change that. Micronet is the big success story of the system. It provides magazine-type information for computer freaks. 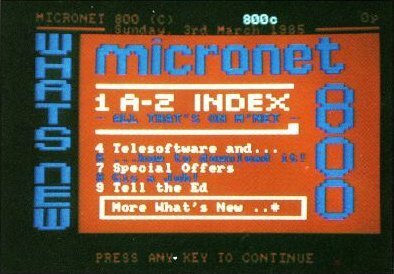 Micronet provides daily news, all of it well written and some of it embarrassing to the computer industry (where else could you get daily updates on the bugs in the QL?). Micronet also provides most of the telesoftware plus educational sections on languages and programming. Prestel microcomputing also encompasses Clubspot, which is provided by the Association of Computer Clubs. This section is put together by a dedicated band of enthusiasts has lots of local news, although some of this is often closer to being history than news. Micromouse is one of the fun sections on Prestel. A kind of gossip column that tells you of the latest exploits in the world of hackers (people who gain unauthorised entry to computer systems) and provides some insight into the world of 'phone phreeks'(people who build little boxes which allow them to make worldwide 'phone calls for free). There is plenty of gossip from the computer world which recently included some information on how insecure bank and credit cards are. The style of this area is very individualistic. 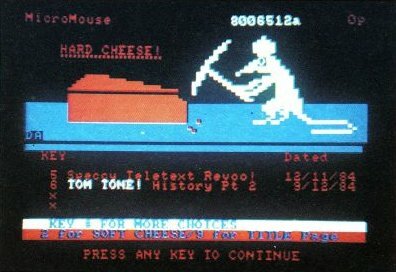 The IP, called Micromouse by Prestel ("Squeaky' to his friends), fills the articles with atmosphere by referring to 'pooters instead of computers and mice instead of people. With a lot of contacts in the US of A', Micromouse is often first with the news and always first with the rumours. Homelink is the service which can most easily be used to justify the expense of the system. The Rank of Scotland and the Nottingham Building Society provide home banking facilities, and from the comfort of your own home you can inspect your bank account, pay bills and move money from one account to another. Like most on-line systems, Homelink is just getting by. In America this kind of set up is much more popular - which is annoying since the Scots invented the telephone and the television. Perhaps our time will come and all the work put in will be hugely profitable. It is not possible to cover a vast subject like Prestel in one feature. There is much left to talk about: the user to user mailboxes, telex links, shopping from home, telebetting, timetables, and megabytes of general information. As with all computing, all you need is the time, the money, the equipment and the money.